Strut your Turkey Feathers through one of the most scenic, fastest, 10k or 2 mile courses around! 10K course also has a Wheelchair Division. 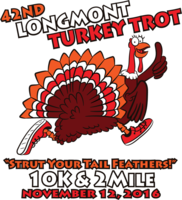 Don’t just run for the fun of it, all of the Longmont Turkey Trot proceeds benefit the City of Longmont Youth Scholarship Fund! Registration ends at 12noon on Thursday, November 10th. Registration will resume on Friday, November 11th from 4-6pm at the Longmont Recreation Center and Saturday, November 12th from 7am-8:30am at Altona Middle School, with an additional $5 late fee. Register before Sunday, October 23, and you'll have your name on your bib! Check out our website for all race details and parking information. Sorry, no refunds for special events.